Saturday I ran the Georgia Death Race for the 3rd time and was lucky enough to come away with the win and a Golden Ticket to the 2018 Western States. The timing of the Georgia Death Race was very good this year as I finished up finals about a week before the race and then spent spring break visiting my grandparents in Florida. The trip to Florida was brief, but it was great to see my grandparents and my aunt and cousin who were also visiting while we were there. Mom, Dad, and I got to play a little bit of golf, go kayaking on the Weeki Wachee River, and spend an enjoyable couple days with family. My brother Jacob didn't join us this year as he's in school at NAU and their spring break was a week earlier. He had a fun time rafting the San Juan River with some friends, then running across Zion National Park a few days later. Two days before the race we made the drive from Florida up to Georgia. Although it was 8 hours on google maps, it took us about 10 which made the day pretty long. But that's why we drove up Thursday. We knew I'd need a day to relax and loosen up my legs after a long day in the car. The pre-race meeting and checkin were not until 5 pm on Friday so I relaxed for most of Friday morning and went for a short walk from Vogel State Park. Mom was able to get a cabin at Vogel, which is where the race starts, so I was able to walk the first couple miles of the course. 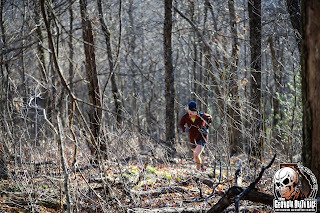 After the pre-race meeting at Amicalola Falls State Park, we drove back to Vogel and headed to bed. I wanted to get as much sleep as I could as I knew that 5 am would come early. Saturday morning I got up at 3:15, ate a small breakfast, then headed down the start line for checkin. 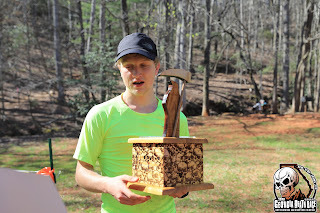 After getting my railroad spike which I would carry during the race, I headed back to the cabin to stay warm and wait for the start. At 5 am, we counted down the last few seconds then took off into the dark. Leaving Vogel State Park, we started on a paved road which quickly gave way to a wide trail, then some narrower single track. The pace felt easy enough so I moved into the lead as we began the gentle 1 mile climb out of Vogel. Everyone was still running together, but no of us were talking much as the dark takes a bit of focus. 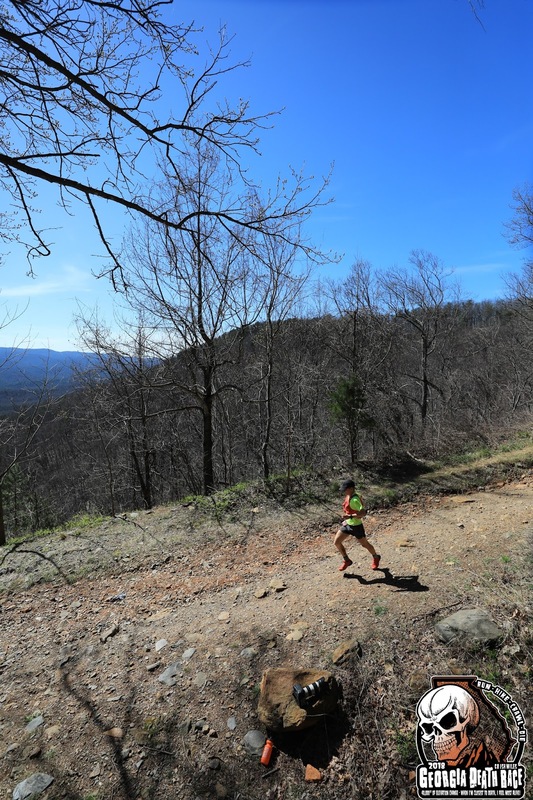 Pretty quickly the course crosses a paved road and descents down a wide trail to the base of the climb up Coosa Bald. As we descended everyone started to spread out, but the top 20 runners were probably within a minute when we reached the bottom of the hill. 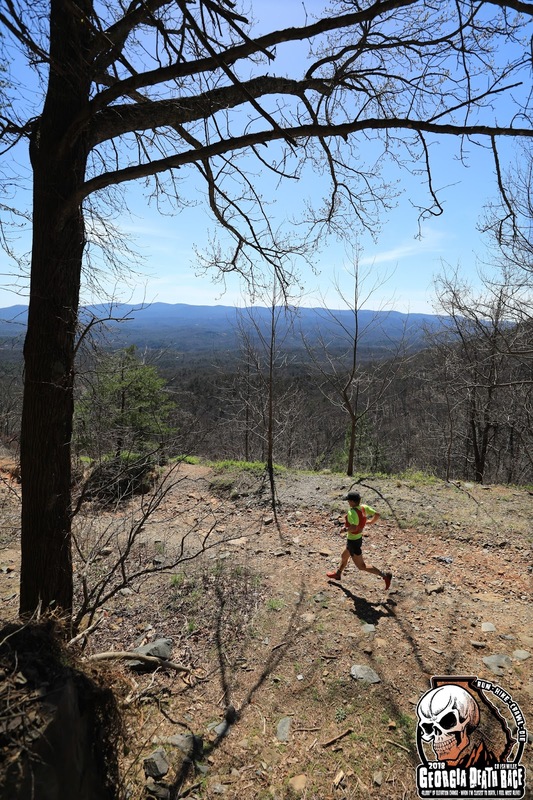 From there, the long climb up Coosa Bald began. 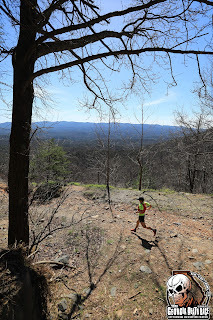 I started out running the climb up Coosa Bald and slowly pulled away from everyone else. About 2/3 of the way up the climb, I needed to go to the bathroom, so I pulled off and took care of business. I probably lost a little over 2 minutes and found myself around 15 place when I got back on the trail. 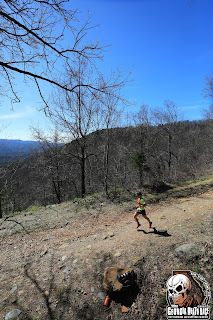 By the time we crested Coosa Bald I was back in the lead with a couple guys just a few steps behind me. 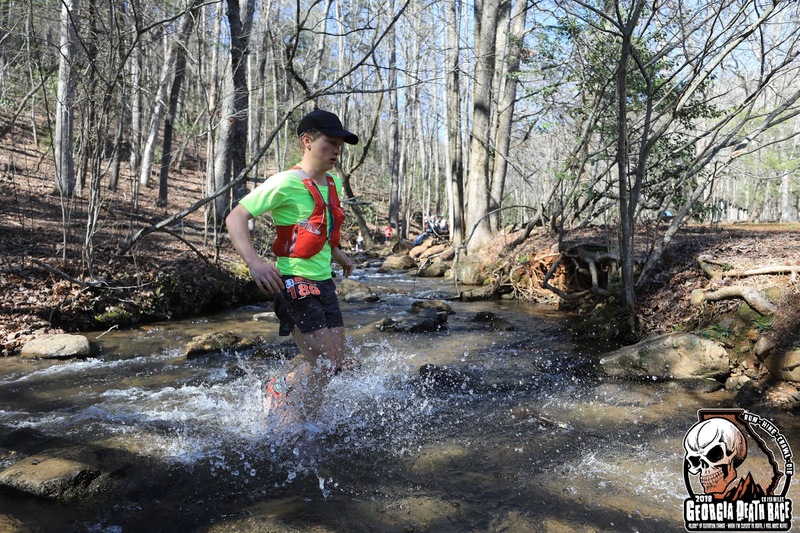 The initial descent of Coosa is steep and a little rocky, but still allows for fast running which lead to a fun downhill. 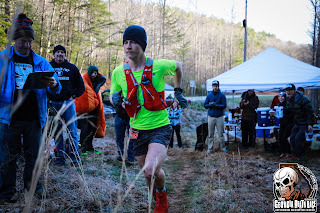 I pulled a little ways ahead of everyone as we passed through the aid station at White Oak Stomp about 5 minutes below the top of Coosa. 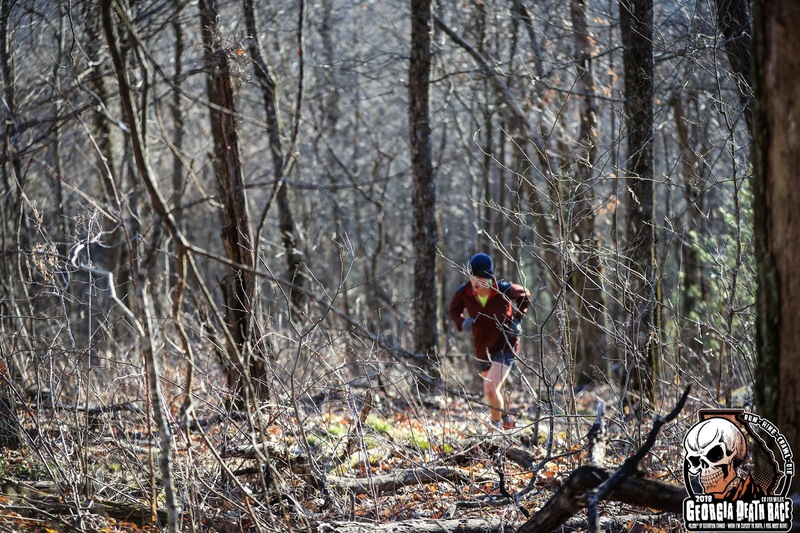 I didn't stop at White Oak Stomp and kept on rolling through the dark. The full moon was beautiful, especially through the leafless trees in north Georgia, but I was ready for the sun to come out. Night running takes a bit of extra focus and its much harder to see anything in the dark. About 7am, my wish came true and the sky soon lightened enough to turn off my light. In the valleys below the ridge I could see patches of fog, but over there wasn't a cloud in the sky. 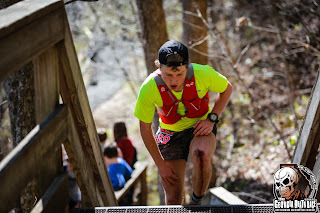 I came into Mulkey Gap feeling good and ran through that aid station too. 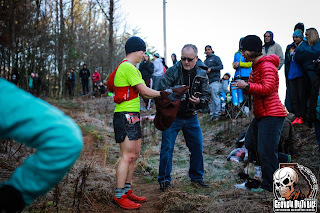 There were some patches of frost on the ridge and I started the race with a liter of water so I hadn't needed to drink much at that point. There's a short climb out of the aid station with one of the few switchback on the course, so I tried to listen for cheering to see how much of a lead I had. I heard some cheers about 5 minutes up the climb, so I knew where the guys behind me were. The next section of the Duncan Ridge Trail has a quite a few steep ups and down, but I was feeling good so made good time through this section. There's a lot of downhills in the section so I was cruising the downhills and grinding out the ups until I had to stop and go to the bathroom. I rarely have to make a pit stop during a race but I think the reason for 2 this race was the early start. 5 am is 2 am on the west coast and I think my digestive system wasn't operating that early. Anyhow, no one past me while I was hunkered down this time so I got back on the trail in the lead. One more climb, then I started down the fast descent into Skeenah Gap. Skeenah Gap had some significance as it was the first crew station and is a two mile round trip out and back. Seeing crew is always nice and the out and back allowed me to see how the runners behind me were doing. I rolled into Skeenah Gap feeling good and quickly lost my jacket, traded water bottles, and got some more VFuel gels. Everyone was cheering and I was feeling good, so I started up the climb feeling strong and excited for the day ahead. The climb up from Skeenah Gap felt good and I didn't pass anyone until I had been climbing for 8 minutes. I figured descending was twice as fast as climbing so I estimated a 12 minute lead. My friend Caleb Denton and Bob Shebest were in 3rd and 4th so I was happy to see them running strong. After the climb up from Skeenah Gap, the Duncan Ridge Trail is mostly downhill until Point Bravo. 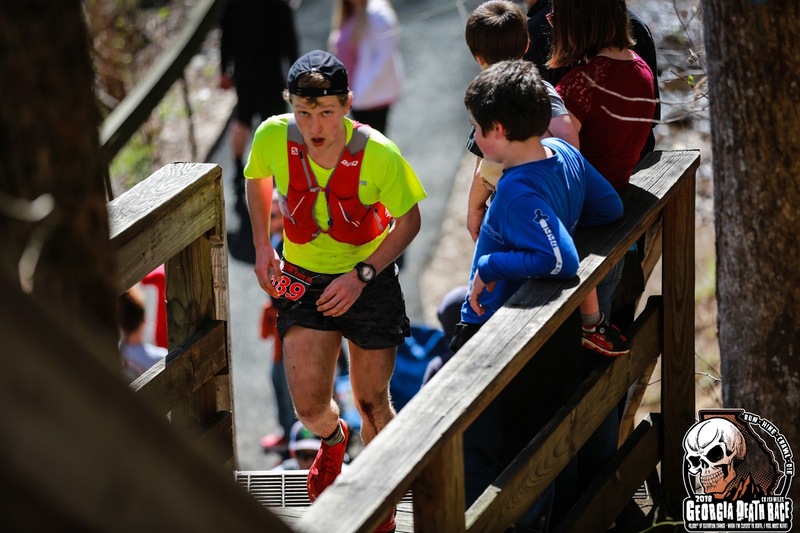 I focused on running with minimal effort in this section while still making good time. About 2 miles before Point Bravo, the trees started to open up a little and I could see the green valleys below. I was picking my head up a little too much because I soon stumbled into a rocky section of trail and took a spill. I made sure to take 10-20 seconds to get up, walk, and asses the damage. Fortunately outside of a bashed knee there was pretty minimal damage. Still, I walked for a few seconds to clear my mind and refocus. I knew if I kept running my knee shouldn't get stiff so I got rolling again and soon came into Point Bravo. At Point Bravo I filled up a water bottle and headed out quickly. The aid station was a good boost of energy to start the climb over Tooni Mountain. The climb went by quickly enough and soon I was descending down to the Swinging Bridge and the bottom of the rolling climb up to Long Creek. The start of the climb was a bit steep but I kept chugging along and soon reached Sapling Gap aid station. 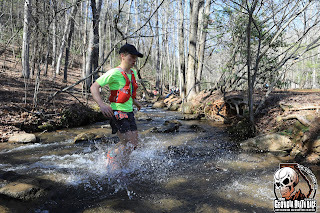 I refueled quickly and kept plodding along toward Long Creek. The climbs were starting to be a bit of a grind, but I knew that all the steep climbing would be done by the time I reached Long Creek (with the exception of the stairs at the finish). After rolling over a couple hills I popped out in a wide open meadow and made a left down to the road leading into Long Creek. I don't remember looking out at the view in this section which is too bad because it was a much better place to look than were I fell coming into Point Bravo. That's the downside of running fast through. You get tired. Anyhow, I hit the dirt road leading into Long Creek aid station and knew I was about 5 minutes away from the aid station. For this first time during the race I was on a sustained flat section so I tried to pick up the pace and make good time. I quickly filled up a bottle with some sports drink at Long Creek and headed on to Winding Stair. The traverse to Winding Stair is mostly flat with some gentle downhill at the start and a little more up coming into Winding Stair. I moved along pretty well in this section and passed a few landmarks I recognized from year's past. My quads were feeling a bit tired on the downhills, but I felt strong on the final uphill coming into Winding Stair. 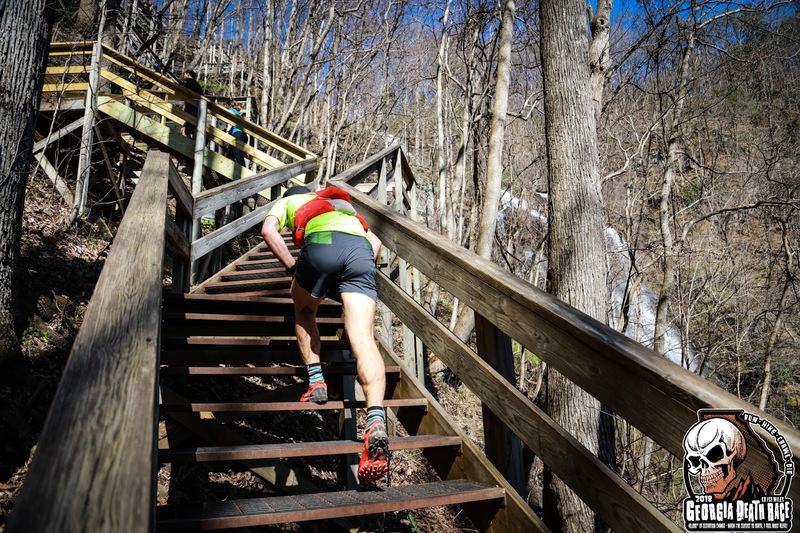 The climb isn't steep by any means, but its about the same grade as the long grind up to Nimblewill Gap at mile 60. 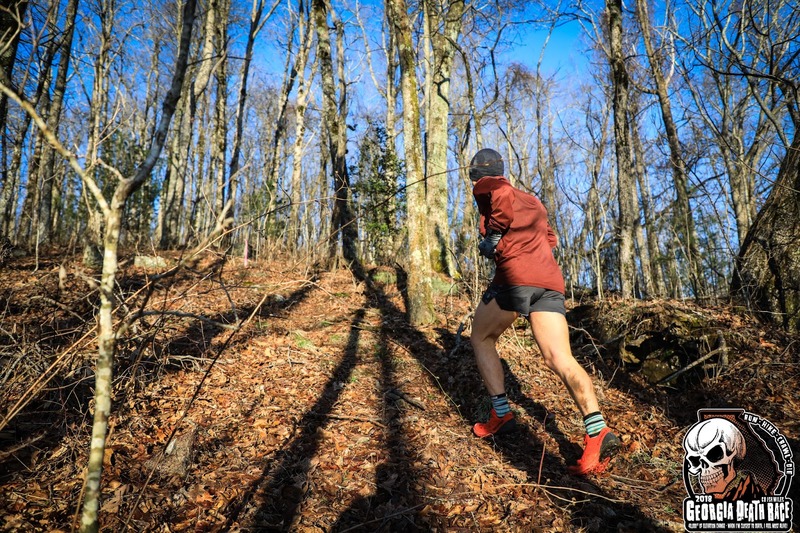 I figured if my climbing legs felt good here, they'd probably feel good climbing up to Nimblewill since that was the next significant climb on the course. I saw my parents for the second time at Winding Stair and felt quite a bit more worn out than when I saw them 23 miles earlier. Still, I got new bottles, some gels, and a hat and was out of the aid station quickly enough. 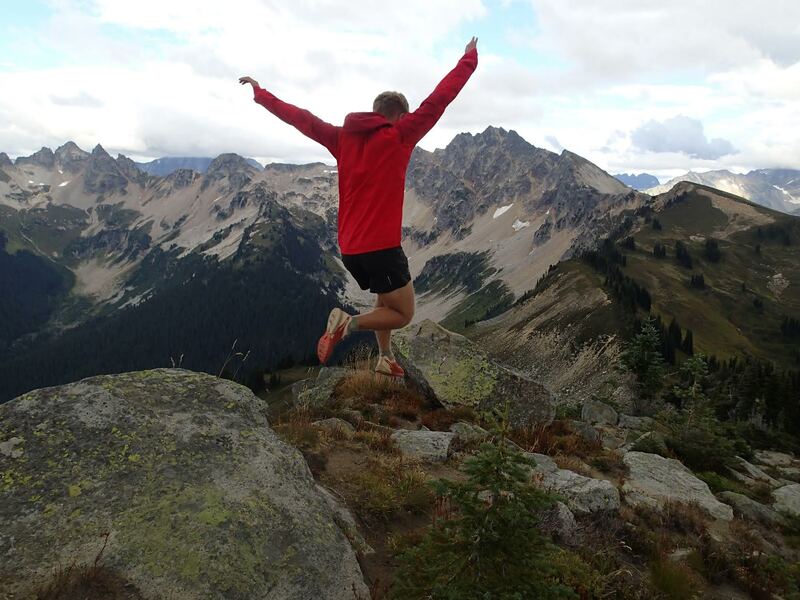 My quads were tired, so I wasn't relishing the descent down to Jake Bull, but I headed out as quickly as I could. The first 20 minutes of the descent down to Jake Bull is on a dirt road. This is an easy place to make good time, so I did my best to open it up on the descent. After that the course takes a left turn down onto some single track. The trail had some rollers, but was mostly downhill and soon crossed Winding Stair road again. I felt pretty strong in this section and aimed to keep up the pace to Jake Bull aid station. The second half of the descent to Jake Bull is all trail and seems to have a few more rollers. 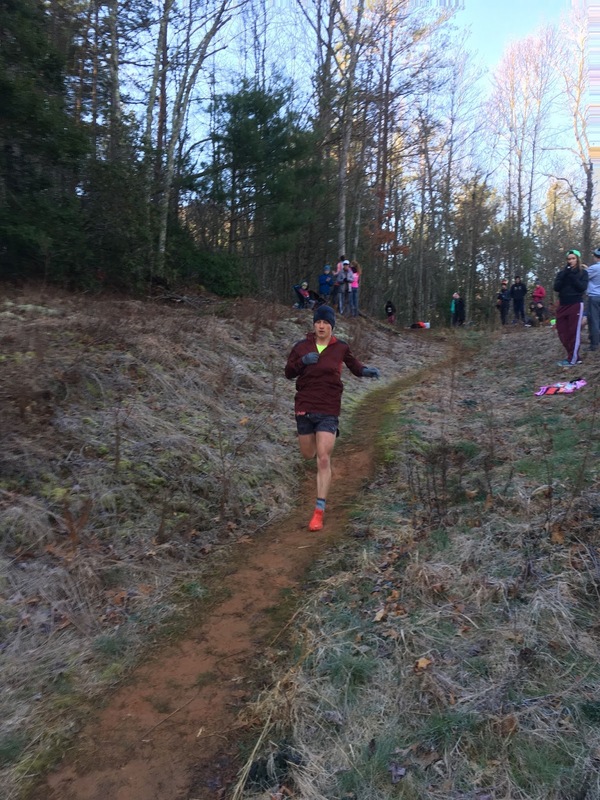 I did my best to move quickly in this section, but was certainly feeling my quads on the switchbacks and steeper downhills. I soon passed the lake about 15 minutes before Jake Bull and could start to feel the day heating up. This section is a little more open, and no longer downhill so that's why I noticed the heat. 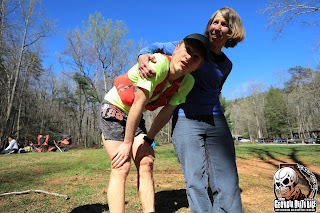 I decided to dump some water on myself to cool down as I knew the aid station was close. 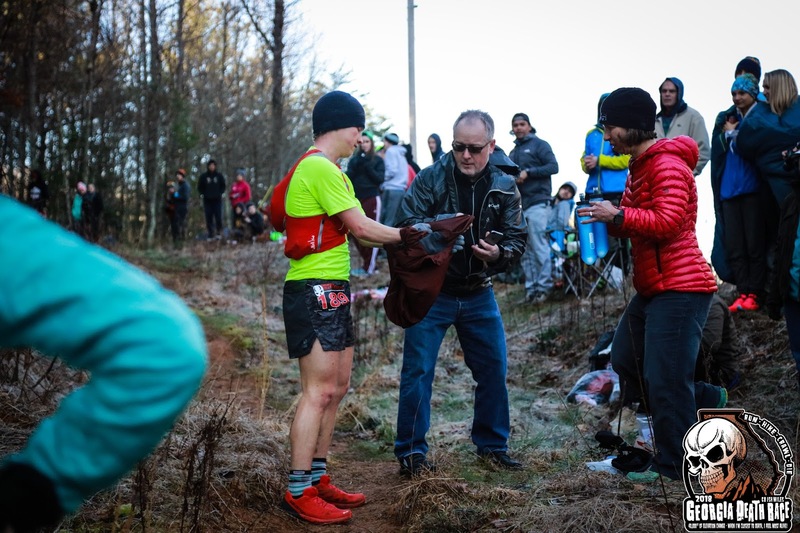 I rolled into Jake Bull and made sure to fill up both bottle and drink a little at the aid station as there was a long climb ahead. The volunteers at Jake Bull were great and I was out of there quickly. The first mile or two out of Jake Bull is on rolling trail where I passed a couple horses. I'm not a huge fan of horses as they are usually a major pain to get around. However this couple pulled of the trail for me and when I asked if I should walk by them they said it was fine to run. I was very thankful they were so cooperative and easy to get around. Thanks horse riders! Soon I hit the paved Nimblewill Gap road which rolls along slowly gaining elevation for 2 miles before turning into dirt. I was feeling hot and tired in this section, but kept moving along ok. 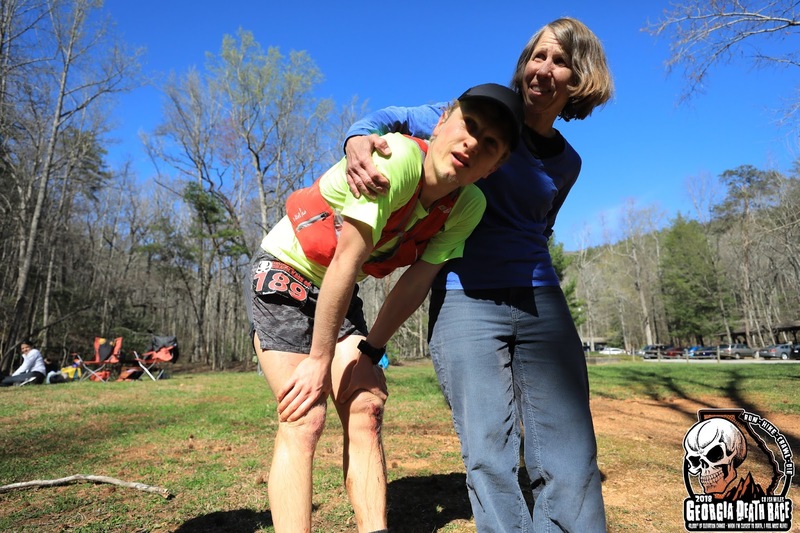 I was starting to think about runners catching up, but I guessed I would have heard something at the aid station if someone else was on my heels. 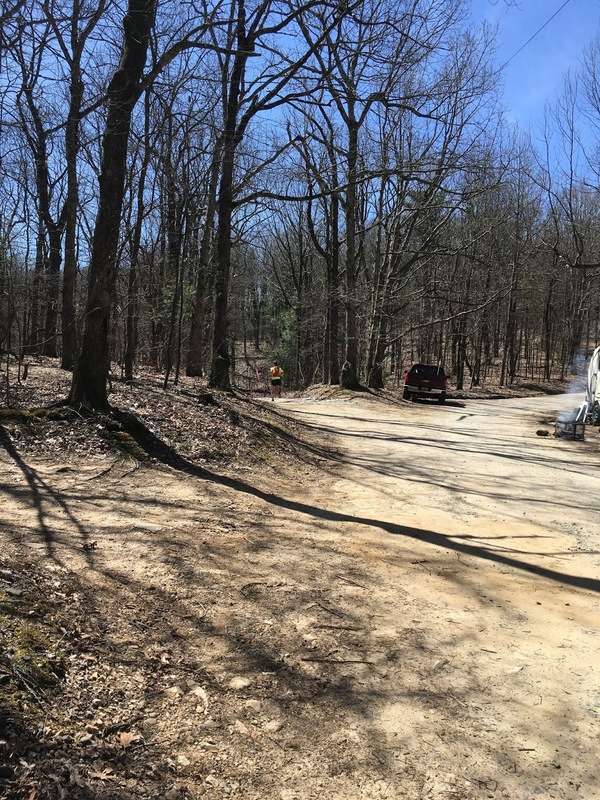 Regardless, I was happy when the paved road turned to dirt as there was a bit more shade in spots and I feel much more at home on potholed dirt road than a two lane paved road. The couple miles of the road are gentle rollers, which offered some fast running. I ran moderately fast, but not quite as fast as I'd hoped I could. That's what happens when you get tired though, the easy sections become hard. Soon the road started a steady grind up to Nimblewill Gap. The grade was never very steep, but was a steady climb the whole way. I don't think there's even a significant dip in the road the last 3 miles up to Nimblewill. I kept chugging up the hill and saw the little gap where I thought Nimblewill aid station should be, but there was no aid station. Maybe it was just around the next corner and this was one gap too early. Once I reached the gap, there was flagging to head left. This was where the aid station was in the past, but not this year. 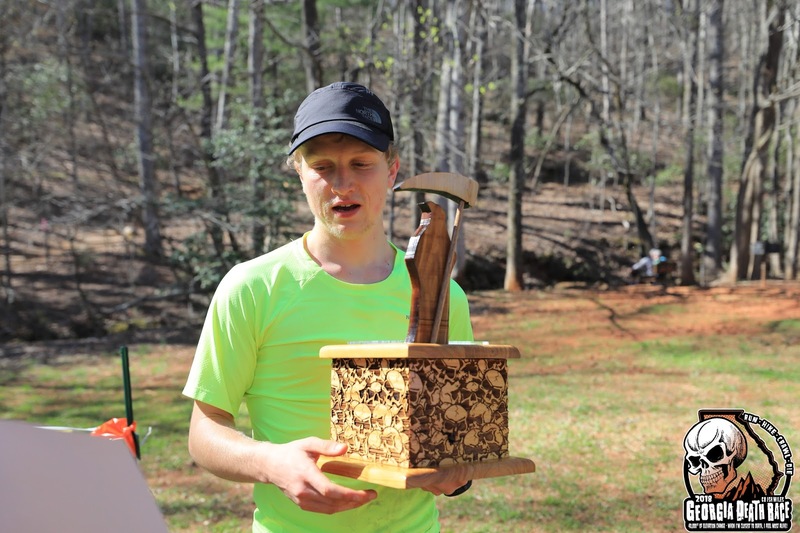 That's why Sean had said it was 11.5 miles to Nimblewill from Jake Bull. 9 miles to here, but not to the new aid station location. This didn't really bother me as I had plenty of water and knew I'd have to run this section anyways. I plugged along on the slight uphill and tried my best to avoid the puddles left by some heavy rainfall a couple nights earlier. I knew the road would level off and head downhill soon so I kept moving along knowing the running would get faster soon. In my opinion, this stretch of road is kind of cool as it starts out as a very rutted old road and slowly expands into a wide gravel road. Just as the road was widening out, I reached the aid station. I got some sports drink and asked how far to the finish. The said about 9 miles. The first mile out of the aid station was on rolling gravel road and I felt like I ran pretty well through this section. When I hit the trail, I kept moving along but it was a bit more technical then I expected. The trail didn't seem to have many straightaways and was a bit rocky in spots which made the running slow. With tired quads the downhills on the twisting rocky trail were not my fastest of the day. Fortunately the uphill were all fairly gentle so I was able to run them all pretty well. I told myself I didn't have far to go, which helped me put a little extra energy into each climb. Still the trail wasn't fast and it took a long time to reach Amicalola. Once I hit the top of Amicalola the course descends down a rocky road which gives way to a rooted trail about half way down. My dad was waiting for me at the top of the section and gave me a cheer as I ran by. At the bottom of the descent Mom was waiting. She cheered me on as I started the last climb of the day. From the bottom of Amicalola Falls there's some smooth dirt trail, followed by steeper paved trail, then a bunch of steps. My plan was simple. Run to the steps, then hike them two at a time till I reach the top. I was ready to be done, but I stuck to the plan and chugged up to the top. I didn't look up. If you do you'll see you aren't close to the top. Dad was here again and gave me a cheer as I turned onto the short stretch of paved road before the last bit of trail to the finish. There were a bunch of people cheering which gave me a some extra energy to keep on moving. On the short section of road, Dad passed me in the car as he drove down to the finish. He gave me a big cheer and was certainly more excited than I was at that point. I turned left off the paved road and passed a volunteer waiting at the top of the east ridge trail which we would descend. I headed down the east ridge as fast as I could, but never got going to fast as the trail was fairly technical and steep. Oh yeah, and my quads were shot. I knew there was one slight uphill on the descent and as I crested that I looked at my watch. I though, maybe I can sneak under 11:30, but I really didn't know how far I had to go. Some where on the descent we left the official trail because the next thing I new, I was skidding down a steep half-trail with the finish line in sight on the other side of the creek. I managed my way down the descent and almost started to the bridge when I saw it blocked with flagging. We don't use bridges at the Death Race, they make it darn easy. The clock was ticking toward 11:30, so I stumble through the creek and ran though the finish line to get it done in under 11 and half. Boy was I glad to be done. This was my first long ultra in almost 2 years and ended up being a pretty grueling finish. I felt pretty good all day, but I was ready to be done for a long time. But that made the finish just that much better. It sure felt good to stop. 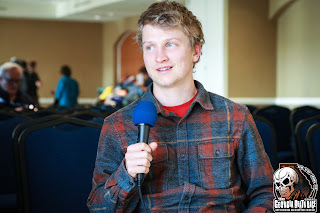 I want to thank Sean Blanton for putting on such a great race, because each year I do it, its a bit harder than the last time. 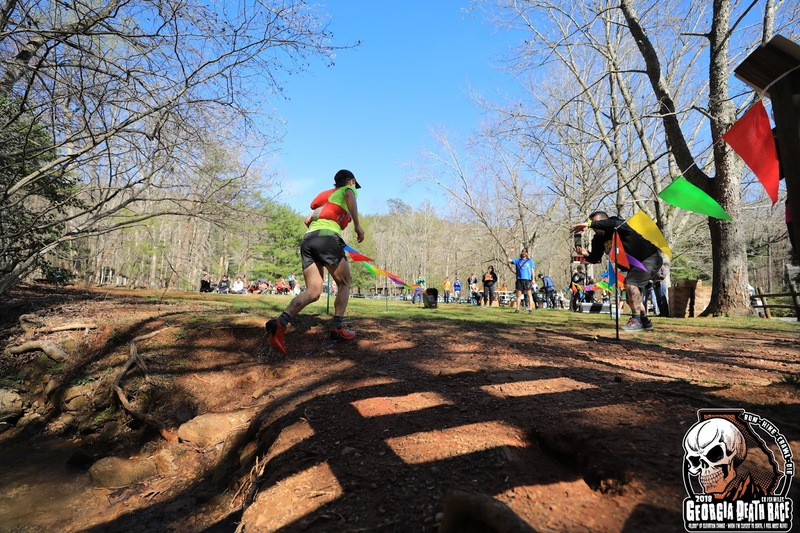 Also, thanks to We Run Racephotos for being out there and getting a lot of great pictures. Most importantly thanks to all the volunteers for being out there. You're encouragement and help is really the only reason anyone of us finishes. Also thanks to my sponsors The North Face, Injinji, VFuel, and Squirrel's Nut Butter. I really appreciate all that you do for me. And a special thanks to my number one sponsor, Mom and Dad! Without you guys crewing for me on race day and beyond there's no way I'd be where I am today. Thanks! I'll see you all in Squaw Valley this June! Hopefully I'll get in some fun running before the big one.